We are proud that Zerflin, a premiere boutique design agency, is a sponsor of Mixed Remixed. “We’re reputable, honest and complete geeks about design and making things look good,” reports Zerflin’s website–but we think really they make things look GREAT! Learn more at www.zerflin.com. We are proud to include among our sponsors the Japanese American National Museum which has been at the forefront of celebrating connectedness between cultures and communities and highlighting the Mixed and multiracial experience by presenting ground-breaking exhibitions like Kip Fulbeck’s photographic portrait exhibitions The Hapa Project and Mixed Kids, and Visible/Invisible: A Hapa Japanese History, and gatherings such as the Hapa Japan conference, the Mixed Roots Film & Literary Festival, and now Mixed Remixed. Learn more at www.janm.org. Mixed Remixed, a media and arts festival, will take place at the Japanese American National Museum, 100 N. Central Avenue on June 14, 2014 in downtown Los Angeles. Mixed Remixed celebrates connection across race and culture through stories. The festival will present several film screenings, readings, workshops, panel presentations, family activities and a live performance focused on Mixed racial and cultural experience including interracial and intercultural relationships, transracial and transcultural adoptions, and people who identify as multiracial, multicultural, Hapa or mixed. The 2014 festival will bring together innovative artists, film and book lovers, multiracial individuals and families, the country’s fastest growing demographic according to recent Census reports. Events are free and open to the public. The festival is spearheaded by Heidi Durrow, a New York Times best-selling author and a founder of the original multiracial film and book festival, which showcased many talented filmmakers, writers, and performers including Comedy Central’s comedic duo Key & Peele, Rebecca Walker, Danzy Senna, Angela Nissel, Kip Fulbeck, Erica Gimpel, Karyn Parsons, and Maya Soetero-Ng. Durrow and the original festival have been featured in the New York Times, NPR and Ebony Magazine and many other media outlets. The call for submissions for films, workshops, panel presentations, readings and performances by writers, actors, comedians, spoken word artists and musicians is open now until Jan. 15. There is no submission fee. For specific submissions requirements and festival information visit: www.mixedremixed.org. Heidi W. Durrow Founder/Executive Producer is the New York Times best-selling author of The Girl Who Fell From the Sky (Algonquin Books), which received writer Barbara Kingsolver’s PEN/Bellwether Prize for Literature of Social Change. The Girl Who Fell From the Sky has been hailed as one of the Best Novels of 2010 by the Washington Post, and a Top 10 Book of 2010 by The Oregonian. Ebony Magazine named Durrow as one of its Power 100 Leaders of 2010 along with writers Edwidge Danticat and Malcolm Gladwell. Durrow was nominated for a 2011 NAACP Image Award for Outstanding Literary Debut. Durrow has been featured as a leading expert on multiracial and multicultural issues and identity by the NBC Nightly News, the New York Times, CNN, National Public Radio, the BBC, Ebony Magazine and the San Francisco Chronicle. She is an occasional contributor to National Public Radio and blogs for the Huffington Post. 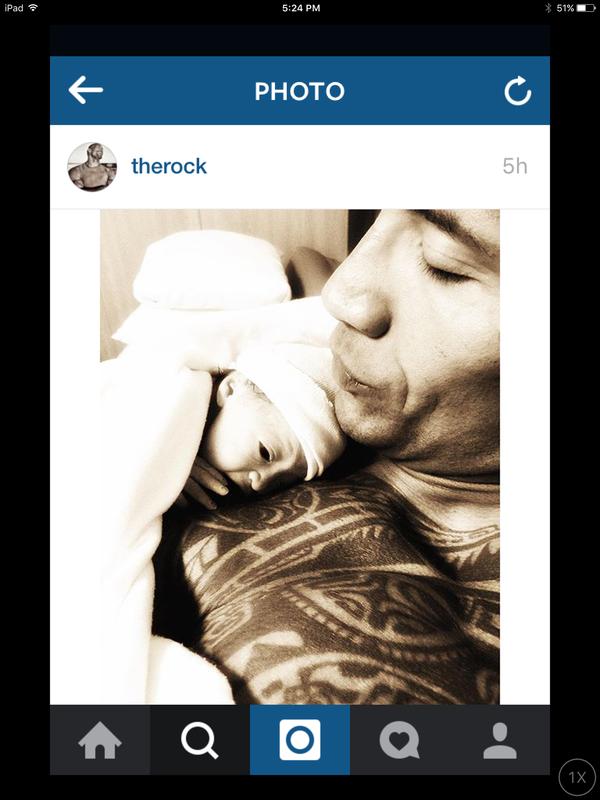 Congratulations to the Rock and girlfriend Lauren Hashian on the their new baby girl Jasmine. And what cutie she is–Just a small chip off an old charming block! We wish you all the best and can’t wait to see how you’re journey continues Jasmine!